While researching the collapse of the rainy phase of the monsoon system and resulting drought that occurred in India during the early years of the 20th century, Sir Gilbert Walker discovered a seesaw variation in pressure between the eastern and western Pacific Ocean. Walker found that when air pressure was high at Darwin, Australia (western Pacific) it was low at Tahiti (eastern Pacific), and when air pressure was low at Darwin, it was high at Tahiti. Walker, however, failed to make the connection between this oscillating pressure pattern and El Niño. This link was made convincingly in the 1960s by the Norwegian meteorologist Jacob Bjerknes, who was also researching the anomalous drought in India. Researchers discovered that during non-El Niño years, surface pressures tend to be low over the warm waters of the equatorial western Pacific as overlying warm moist air rises and then diverges aloft. Over the colder waters of the eastern equatorial Pacific, surface pressures tend to be higher as converging winds aloft contribute to the sinking of cool air. In much the same way as a ball rolls down a hill, air flows from high pressure in the east to low pressure in the west along this equatorial pressure gradient. This contrast in pressure is what drives the trade winds, the prevailing large-scale surface winds that blow from east to west. As these winds blow along the surface of the equatorial waters, there is a net transport of ocean water in a westward direction. As this occurs, cold, nutrient-rich water rises up (or upwells) along the coast of South America to replace the westward-moving surface water. This upwelling brings nutrients to the surface waters off the coast allowing the fish population living in these upper waters to thrive. 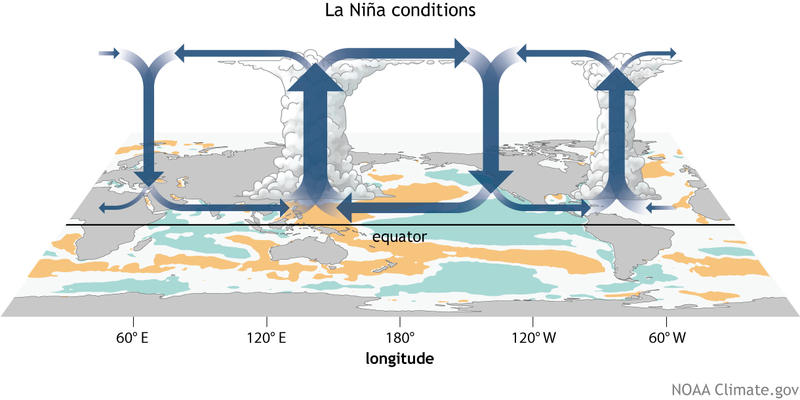 During La Niña years, the trade winds are unusually strong due to an enhanced pressure gradient between the eastern and western Pacific. As a result, upwelling is enhanced along the coast of South America, contributing to colder than normal surface waters over the eastern tropical Pacific and warmer than normal surface waters in the western tropical Pacific. 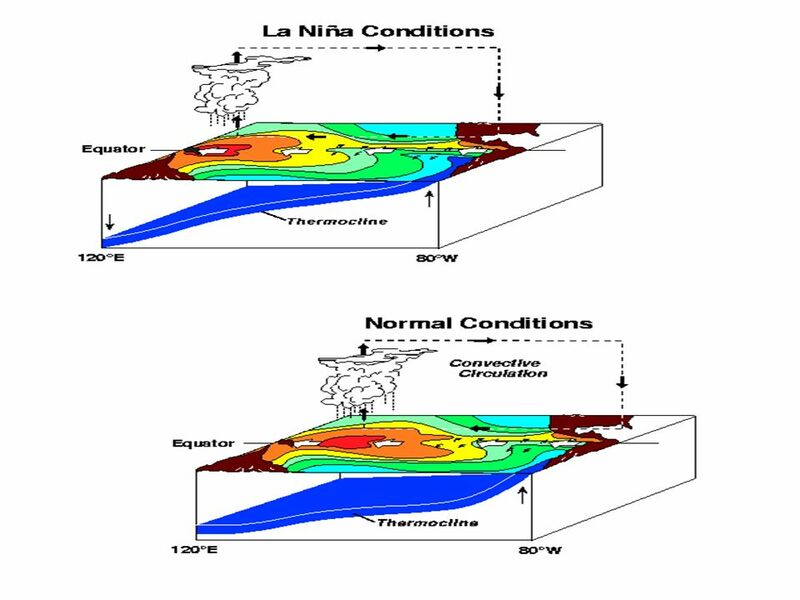 Changes in global atmospheric circulation patterns accompany La Niña and are responsible for weather extremes in various parts of the world that are typically opposite to those associated with El Niño. 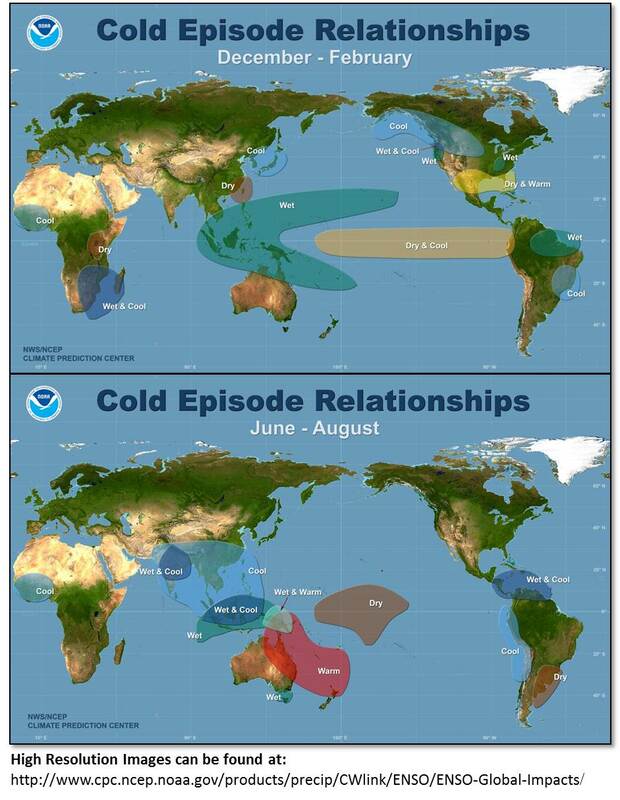 These patterns result from colder than normal ocean tem peratures inhibiting the formation of rain-producing clouds over the eastern equatorial Pacific region while at the same time enhancing rainfall over the western equatorial Pacific region (Indonesia, Malaysia and northern Australia.) These patterns affect the position and intensity (weakening) of jet streams and the behavior of storms outside of the tropics in both the Northern and Southern hemispheres. The first three months of the year during a La Niña typically feature below normal precipitation in the Southwest, the central and southern sections of the Rockies and Great Plains, and Florida. Meanwhile, the odds of surplus precipitation increase across the Pacific Northwest, in the northern Intermountain West, and over scattered sections of the north-central states, Ohio Valley, and upper Southeast. La Niña features unusually cold weather in the Northwest and (to a lesser extent) northern California, the northern Intermountain West, and the north-central states. Farther south, higher than normal temperatures are slightly favored in a broad area covering the southern Rockies and Great Plains, the Ohio Valley, the Southeast, and the mid-Atlantic states. Globally, La Niña is characterized by wetter than normal conditions west of the equatorial central Pacific over northern Australia and Indonesia during the northern hemisphere winter, and over the Philippines during the northern hemisphere summer. Wetter than normal conditions are also observed over southeastern Africa and northern Brazil, during the northern hemisphere winter season. During the northern hemisphere summer season, the Indian monsoon rainfall tends to be greater than normal, especially in northwest India. Drier than normal conditions are observed along the west coast of tropical South America, and at subtropical latitudes of North America (Gulf Coast) and South America (southern Brazil to central Argentina) during their respective winter seasons.